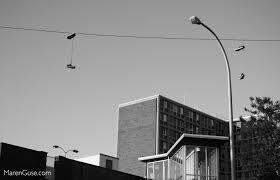 There were sneakers tied together and hanging on a wire that crossed the street above her. The echoes of sirens, a dog barking and airplanes flying overhead filled the cavernous streets. On each side of the road there were homes connected and crowded together as if to fit as many as possible on the small lots. The sidewalks were broken up by the roots of trees that seemed to have been around since the Jurassic era. Horns honking and bass beat pulsing along with the occasional “Cat in heat” moaning. Eddie was running because he wanted more from the girl he had once decided to spend the rest of his life with. The years since that evening in the diner had found him scarred and crazy glued to the past. The songs he listened to were from that time period in the late 70’s and the romanticized past was waxed free of any pain or indignity. Eddie saw Brenda leave and he knew he needed to spend some more time with her and this time he wouldn’t let her get away so easily. “Brenda.” He called out, she turned and stopped. “Eddie…” She said it with a smile and it was 1978 all over again. She wanted to say no, she wanted to tell him to let go of what they once had because it was only a pitstop to where they each needed to go. She wanted to tell him that she was married and found it inappropriate to walk and be with another man.